First, Wikipedia said “George” Ohsawa (note spelling of first name) died of a heart attack, not stomach cancer, as was commonly supposed. Scene: 1968, August, probably, an apartment on Missoula’s northside. Brick. Same one Larry Felton rented at some point when he worked for Northern Produce wheeling potatoes around a warehouse. John’s friend wasn’t the least bit friendly to me. Seemed sort of arrogant about his expensive Martin guitar that he played open tuned with a brass slide. First time I ever saw one of those. I was between girlfriends. My electric Gibson was at my brother’s. I think I had just gotten back to town by freight train from somewhere west. It was always Seattle or somewhere in the summer of ’68. John’s friend kicked us out of his apartment. Hennessy, a couple years older than us, whom I regarded as a “real hippie,” could see that I had recently taken some sort of psychedelic drug, so he invited us to go camping by the river. John and I went. I must have had my eyes closed because the wheels seemed to rub in the fender wells and a Cream’s “Disraeli Gears” 8-track tape was making fantastic colors in my brain as it blasted full volume. Neither John nor I had any sleeping bags, so we searched the area along the Clark Fork for bits of wood to put on the campfire as the Cream’s music echoed through my consciousness. Later he travelled to Europe, particularly Paris, France where he started to spread his philosophy (it is in this period he supposedly adopted his new pen name “Ohsawa”, after the French “oh, ça va” which means “all right” or “I’m doing fine” as a reply to the question “how are you doing ?”). After several years he returned to Japan to start a foundation, and gather recruits for his now formalized philosophy. My brother Tom and the other elder hippies agreed that eating brown rice was good, but none was as fanatical about the diet as I. As far as I could tell one should eat only short grain unpolished whole brown rice. 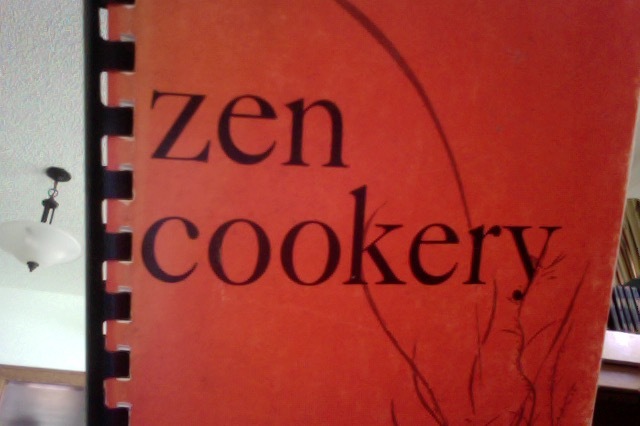 In the 1966 edition of “Zen Cookery” that I found in a junk store, that P. almost wouldn’t let me bring into the house, the term “organic” does not appear. On my own, with the firm belief that Zen Macrobiotic Cooking was the way to peace of mind and goodness, afraid of Vietnam, living nowhere, really, I decided to seek my fortune in Seattle. My friend John Herman was not persuaded by my theories regarding food. I had some hang-ups because all my girlfriends up to that point were unable to fix me anything that didn’t make me vomit. I’m talking rice and beans, undercooked. Poorly cooked. One succeeded with a can of cream of mushroom soup, but she gave me the boot when she sensed my worthlessness. This sense I didn’t share with her. Ultimately I caught a ride to Seattle with a friend who had a VW bug that 5 or 6 of us crammed into. I stayed at my friend Bill Reynold’s, on his couch. He and his wife ultimately urged me to find my own place, which I did, just 2 doors away, in the University District of the University of Washington in Seattle. I still remember the zip code. You know how Missoula’s was 59801? The one in Seattle was 95801. Or not. I made that up. Once in my own place, which was the front room of a bungalow that had a bed and a chest of drawers, I needed $40/month for rent. Tom loaned me the money because he and Bill and Mary all worked. The men worked for the parks department and Mary worked in a bookstore closer to the university. Not the famous Id bookstore close to hippie hill, but one on University Avenue a block or two away. My plan was to sell the hippie newspaper, “The Helix” at 10 cents profit per. Came out once a week, I think. Man, I had a hard time selling them. I got about 30 cents for an hour’s work. I needed to buy brown rice for my Macrobiotic Diet. I had some of that at my place. On my way to get a supply of the “Helix,” I walked near a sandwich shop that sold forbidden meat, forbidden tomatoes, forbidden potatoes, lots of mayonnaise, the works. I blushed with guilt as I ate up all of my profits.